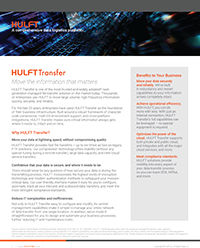 HULFT Transfer is the next-generation solution for moving vital information quickly, securely, and reliably, with supporting services from UK partners Influential Software. HULFT Transfer is one of the most widely adopted managed secure file transfer solutions worldwide. 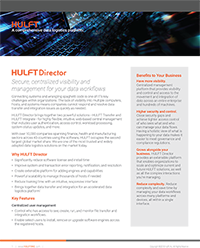 HULFT is as much as six times faster than legacy FTP transfers, leaving more time for your business initiatives. Combined with HULFT Director for data logistics, you have an intuitive interface that brings all your data sources together for rapid reaction. Tens of thousands of businesses in 43 countries have chosen HULFT Transfer to provide their data logistics solutions. Now UK enterprises can achieve the same results, with HULFT’s UK partners Influential Software. HULFT is a global provider of data logistics solutions that find, secure, organise, transform, and move the business data that matters most. HULFT’s three complementary solutions are HULFT Integrate, HULFT Transfer, and HULFT Director. Influential Software’s HULFT team is qualified to advise your business on the best combination of HULFT solutions for your business needs. With HULFT Director, businesses can bring HULFT Transfer together with HULFT Integrate to create a full data management package. 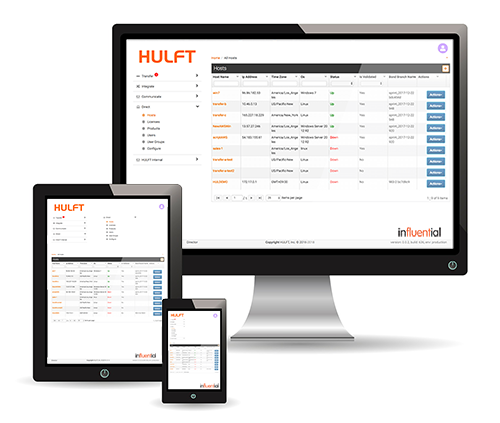 HULFT Integrate offers an intuitive, drag-and-drop approach to the creation of complex data workflows, while HULFT Director connects HULFT Integrate with HULFT Transfer. This trio allows your business to manage integration and transfers from a single platform. The capabilities of HULFT Director and HULFT Transfer can revolutionise any business in need of simple, fast, and reliable data logistics. HULFT and Influential have a strong record across a variety of sectors. Finance: Ever-rising volumes of data and stringent data regulations have made data transfer solutions of top importance. Discover how HULFT can optimise businesses in the financial sector. Healthcare: The amount of medical data spread across electronic medical records, systems, and devices makes secure data logistics a necessity. See how HULFT has solved challenges in the healthcare sector. Manufacturing: Big data and the Internet of Things have made manufacturing data a priceless commodity. HULFT’s solutions have made waves in the manufacturing sector. As HULFT’s UK partner, Influential is uniquely placed to provide the full range of HULFT data logistics services. Influential and HULFT both have 25 years of experience in the sector. Meaning your data is in safe hands.